Q: I imported data from Quicken, but cannot find purchase info for items? A: In Attic Manager, this data is stored in Changes and Notes section. Each item in that section contains the Date, Value (amount paid) and Description (Store name, address, etc.). Q: Can I sum up the values? A: Attic Manager shows the sum for current selection in the status bar at the bottom of screen at all times. The current selection are items shown in the list, and you can change it by clicking a different location on the left side, and/or filtering via search box. To sum up all items, just select "My Locations" item on the left side. If you need to sum up the values in some other, specific way, the best way is to export the data to CSV format and then open it up in Excel or OpenOffice and sum it up as you desire. Q: Does Attic Manager work on Windows 10? A: Yes. Please note that if you need to import database from Quicken and the file extension is .MDF or .QHI, you will need to use Windows XP or Windows 7 computer to import the database into Windows 10. Once you import the Quicken data, you can then keep using Attic Manager on Windows 10 and you wouldn't need access to Windows XP or Windows 7 anymore. Q: Can I load Quicken Home Inventory data on 64bit Windows? If you have an .IDB file, it is pretty straightforward: just run Attic Manager, and select Import data from QHI from the Database menu. If you have a .MDF file, please see the detailed instructions for Windows XP, Windows 7 and Windows 8. If you have a .QHI file and Windows XP, Vista or 7 just run Attic Manager, and select Import data from QHI from the Database menu. If you have a .QHI file and Windows 8, you need to import the data once using Windows XP or Windows 7 computer. Then run the Backup option from the Database menu and transfer the backup with to your Windows 8 computer and use the Restore option in the Database menu to load the database. At that point you can delete the intermediate copy of Attic Manager on Windows XP/7 if you want. Attic Manager license allows you to use a single copy on multiple computers, so you are free to do this. If you have a .MDF or .QHI file and Windows 10, you need to import the data once using Windows XP or Windows 7 computer. Then run the Backup option from the Database menu and transfer the backup with to your Windows 8 computer and use the Restore option in the Database menu to load the database. At that point you can delete the intermediate copy of Attic Manager on Windows XP/7 if you want. Attic Manager license allows you to use a single copy on multiple computers, so you are free to do this. If you don't have access to any Windows XP or Windows 7 computers, please contact us and we can convert the database for you, free of charge. Q: Can I load Quicken Home Inventory data on Mac OSX? A: If you have QHI file ending with .IDB extension you can do it directly. Just run Attic Manager on Mac and select Import data from QHI from the Database menu. However, if you have a file with .QHI or .MDF extension, you will have to use a Windows computer (just once) to transfer the database from Quicken's into Attic Manager's format. After that you can transfer the database in Attic format to your Mac computer and use it there. Q: Can I run Attic Manager on an older Mac? A: Attic can run on OSX 10.6 if your system is 64bit. It could also run on 10.5 and 32bit 10.6. If you require a special build, please contact me. Q: Can I run Attic Manager from USB stick? A: Although you might succeed, this setup is not officially supported. To ensure everything works properly, make sure you run it off a real hard disk. Q: Where is the database file? A: Attic Manager's database file is called attic.fdb and it is stored in the same location as executable (attic.exe on Windows). On Mac, the file is stored in Attic Manager .app folder inside Resources subdirectory. Manipulating this file directly is not recommended. If you need to create a copy, please use the Backup option in the Database menu in the application. The created backup file has extension .fbk and you can open it by using the Restore option in the Database menu. Q: Can I load Quicken Home Inventory data with Standard version? A: No. To load Quicken data, you need to have either Pro or XD versions of Attic Manager. Q: Can I run Attic Manager on multiple computers with one license? A: Yes. Attic Manager license allows you to run it on multiple computers as long as you are the primary user of each copy. Q: Can I maintain multiple separate databases? A: You can. Please read the detailed instructions. Q: How to start with a blank, empty database? A: Attic Manager comes with a backup of a completely empty database which you can Restore using the option in the Database menu. The empty backup file can be found in the directory where Attic Manager is installed. The file name is empty-database.fbk. A: Attic Manager cannot run from .dmg directly, because .dmg is a read-only file. To work properly, Attic Manager has to be installed to a local hard disk. To install, simply drag and drop Attic Manager icon from .dmg file to you Applications folder and then run it from there. If you want to install it somewhere other than /Applications, you can do that as well. Q: Attic Manager can't be opened because it is from an unidentified developer. 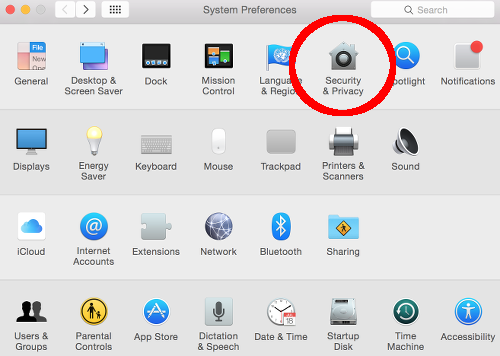 Your security preferences allow installation only of apps from the Mac App Store and identified developers. 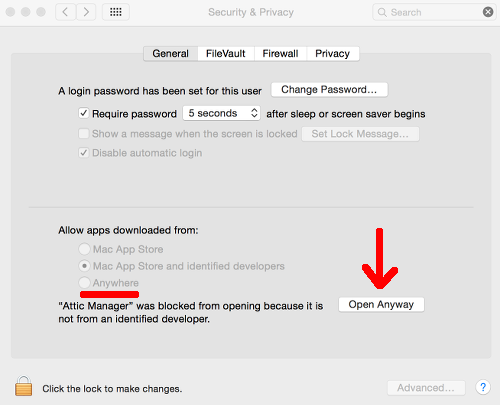 A: To allow Mac to install the Attic Manager, go to the Security&Privacy section and click Open Anyway for Attic Manager. The Open Anyway option is available only for the most recently installed programs. If you don't see the option, then unlock the dialog (click the lock icon in bottom-left corner) and then click the third option (which reads: Anywhere). Then run Attic Manager, and after you run it for the first time, you can come back to this screen and reset the setting back to Mac App Store and identified developers.